When you get into the kinds of things I get into, it is useful to be able to recognise different handwritings - or, in the case of Dr Seichter, his typewriters. 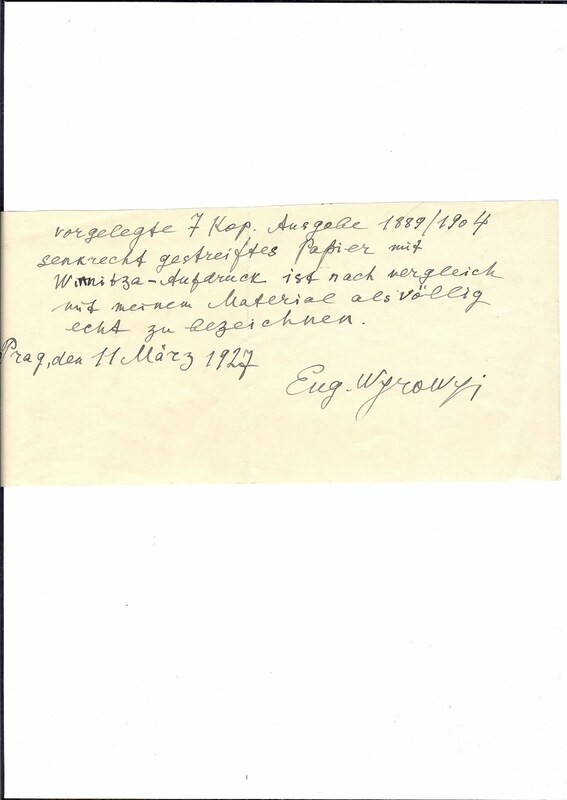 So I was pleased to get this example of Eugene Vyrovyj's handwriting. He was one of the great pre-1939 collectors of independent Ukraine, winning important Medals for his Podillia Tridents. This 1927 piece of paper is part of an Attest for a Russian 7 kopeck on vertically laid paper with a Vinnitsa Trident overprint. Unfortunately, I don't have the stamp! 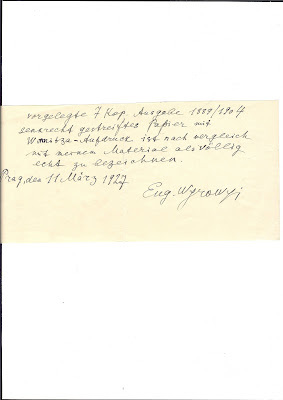 You can sometimes find his handstamp on stamps and formular cards - just the one word VYROVYJ in capitals. As I understand it, Vyrovyj was closely associated with the exiled Ukrainian community in Prague. I have found in dealers' boxes occasional letters adressed to him. He appears to have committed suicide in 1947, perhaps because he was politically vulnerable, but his collection from pre-war times did not appear in auction until the 1980s when Schaetzle sold it in Switzerland. Remarkably, they broke it down into very many individual Lots and illustrated most of them - I acquired the photographic negatives for the catalogue some years ago and passed them on to a client. If you can get hold of the original catalogues, they are quite useful just because of this profusion of illustrations.